The Green 500 list, published in November 2018, shows Japan with four of the top positions and the United States with three. Also on the list are machines from Spain, China and Taiwan. Three of the top ten Green 500 also place in the top 10 of the TOP500 supercomputer rankings. Two are from the United States and one is from Japan. The Green 500 list, published in November 2017, shows Japanese machines holding not only the top spot, but seven of the top ten spots. The United States, the United Kingdom,and Switzerland hold the other three. Three of the top ten Green 500 also perform well on the Top 500 list of most powerful supercomputers overall. Machines from Japan hold #4 and #13 positions on the Top 500; a machine from Switzerland is #3. Top500.org reports, "Besides being one of the more powerful supercomputers in the world, [Switzerland's] Piz Daint is also one of greenest – thanks largely to the highly energy-efficient [NVIDIA Tesla] P100 silicon. Drawing just 2.3 MW of power while running Linpack at full tilt, the system logs an energy efficiency ratio of 8.6 gigaflops/watt. That rises to 10.4 gigaflops/watt for a more power-optimized run." The Green 500 ranks supercomputers in energy efficiency. Piz Daint is ranked #3 in power on the Top 500 and #6 on the Green 500. This gives the Swiss machine the best power/effiiciency trade-off. The five more-efficient machines are ranked in #61 - #466 in power. The most recent ranking (Novemebr 2014) still shows the top performer to be China's Tianhe-2, a position it obtained in June 2013. (Tianhe translates as "Milky Way" in English.) An American supercomputer installed in Switzerland is the most energy-effieicnt of the Top 10 machines. Top 500 Supercomputer Sites put China's Tianhe-2 supercomputer at its #1 position in June 2013 and keeps it there in the November 2014 rankings. The Piz Daint Cray XC30 at the Swiss National Supercomputing Centre (CSCS) at #6 is the most energy efficient Top !0 machine at 2.7 gigaflops/W. It has been most energy efficient since it enter the list in Novemebr 2013. The current (October 2012) contender for most powerful is the US government's Titan. Like many recent supercomputers, it strives for both compute power and energy efficiency by using conventional CPU chips working with GPU chips from consumer gaming. “'One challenge in supercomputers today is power consumption,' said Jeff Nichols, associate laboratory director for computing and computational sciences. 'Combining GPUs and CPUs in a single system requires less power than CPUs alone and is a responsible move toward lowering our carbon footprint.'" Despite this, the annual electricity bill for Titan will be $9 million. A project begun in 2002, Supercomputing in Small Spaces (SSS) "…has evolved in two different directions: (1) a low-power, architectural approach and (2) a power-aware, software-based approach." Principal investigator Wu-chun Feng tells us that site updates have lagged, but the SSS publications page is current, including papers from 2012 Green ICT conferences. The latest Top 500 Supercomputer Sites (June 2012) gives the top spot to the United States's Sequoia, the latest configuration of the IBM BlueGene/Q. It displaces Japan's K computer (below) from Fujitsu, which now occupies the #2 position. The BBC notes that, "The IBM supercomputer is also more energy efficient than the Fujitsu model. Sequoia consumes 7.9 megawatts compared to the K computer which uses 12.6 megawatts." The November 2011 Top 500 Supercomputer Sites gave the top spot to Japan’s K Computer. It displaced China's Tianhe-1A, which moved to the #2 position. The Top 500 site notes that, "The K Computer is also one of the most energy efficient systems on the list." In another example of high-performance energy efficiency that year, IEEE Spectrum reports on China's Godson-3B processor, "With a peak frequency of 1.05 gigahertz, the Godson is slower than its competitors' wares, at least one of which operates at more than 5 GHz, but the chip still turns heads with its record-breaking energy efficiency. It can execute 128 billion floating-point operations per second using just 40 watts—double or more the performance per watt of competitors." China's Tianhe-1A claimed the title of the worlds fastest computer in 2010. It uses a mix of CPUs and GPUs to generate this performance while consuming less energy than is typical of its class. GPU manufacturer NVIDIA explains, "a 2.507 petaflop system built entirely with CPUs would consume more than 12 megawatts. Thanks to the use of GPUs in a heterogeneous computing environment, Tianhe-1A consumes only 4.04 megawatts, making it 3 times more power efficient -- the difference in power consumption is enough to provide electricity to over 5000 homes for a year." This is one of several new approaches to supercomputer design targeting their enormous energy consumption and cooling needs. A 2008 article in IEEE Spectrum described a Japanese supercomputer of similar power, when focused on specific tasks, to IBM's Roadrunner, then the king of the computing hill. The author says that the Japanese machine cost one-tenth of the price and consumes one-tenth of the power because of its "purpose-built" architecture. A typical top-tier supercomputer requires over 1MW of input power annually and at least that much again to cool it. This represents thousands of tons of carbon emissions per year for a site powered by fossil fuel. 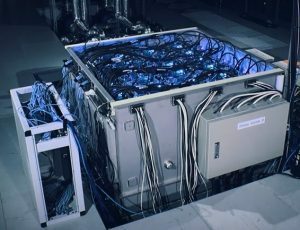 The long-term research viability of purpose-built supercomputers is still debated but their cost benefits and environmental value are undeniable. The first proposed application is climate modeling, which can have its own carbon footprint! American [sic] Micro Devices' Opteron processor core, for example, can easily outperform one of Tensilica's embedded processors. "Only" 1.7 million AMD Opterons would be needed to carry out the 10 petaflops required to simulate Earth's atmosphere at cloud-resolving resolution. So you might then be tempted to assemble a climate-modeling supercomputer out of standard dual-core Opteron chips. But that would be foolish. Even if you could foot the initial bill, which we estimate would be more than a billion dollars, you probably couldn't afford to run it, because it would consume almost 200 MW, costing perhaps $200 million a year for electricity. In contrast, a Tensilica-equipped Green Flash would sip power, relatively speaking, requiring only 3 MW, a level many large computer centers are already equipped to handle. For more information about this project's power trade-offs, see section 4.2 of the US NERSC research paper. Green Flash is just a design concept right now, while Tianhe-1A is an operating machine. One area innovators are building machines using CPUs designed for embedded applications like mobile devices is to create mega-servers. Higher processor speeds are usually associated with higher heat generation, which in turn increases the energy required to cool the equipment and worsens a supercomputing or cloud service facility's PUE. In contrast to typical CPUs, processors designed to be embedded in devices are specifically designed for low power consumption. More on supercomputer energy efficiency.